This image shows what appears to be a large patch of fresh, untrodden snow – a dream for any lover of the holiday season. 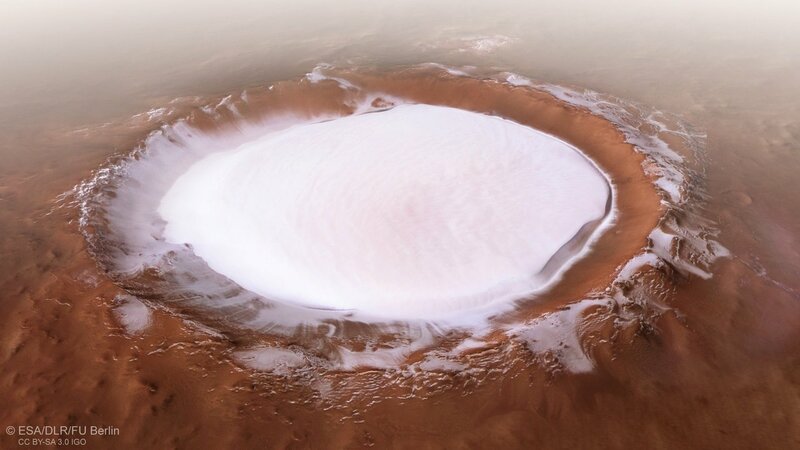 However, it's a little too distant for a last-minute winter getaway: this feature, known as Korolev crater, is found on Mars, and is shown here in beautiful detail as seen by Mars Express. ESA's Mars Express mission launched on 2 June 2003, and reached Mars six months later. The satellite fired its main engine and entered orbit around the Red Planet on 25 December, making this month the 15-year anniversary of the spacecraft's orbit insertion and the beginning of its science programme. These images are an excellent celebration of such a milestone. 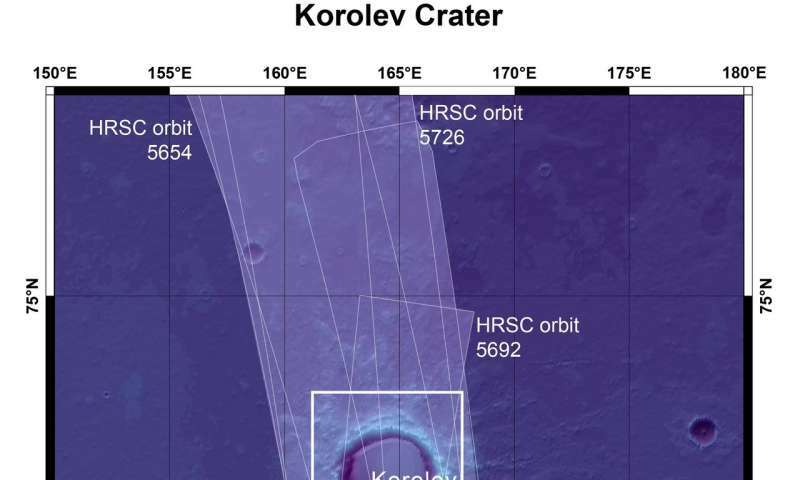 Taken by the Mars Express High Resolution Stereo Camera (HRSC), this view of Korolev crater comprises five different 'strips' that have been combined to form a single image, with each strip gathered over a different orbit. 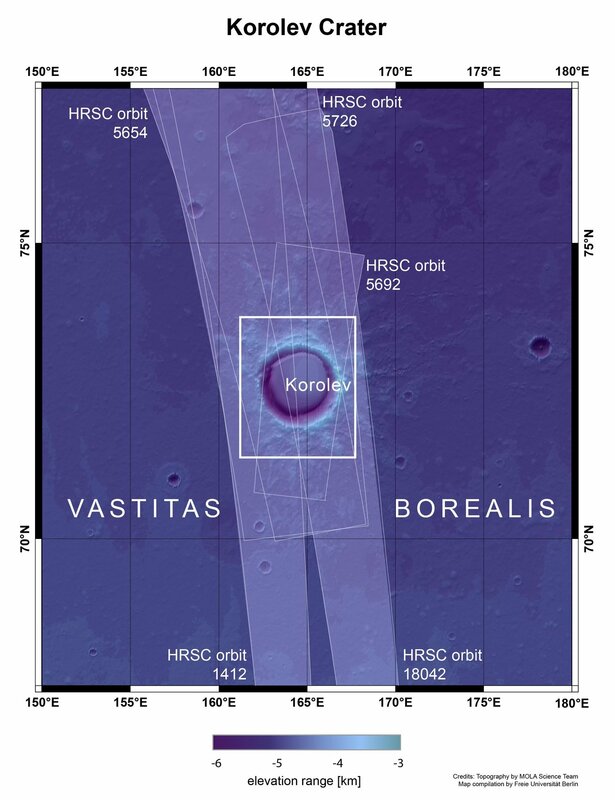 The crater is also shown in perspective, context, and topographic views, all of which offer a more complete view of the terrain in and around the crater. 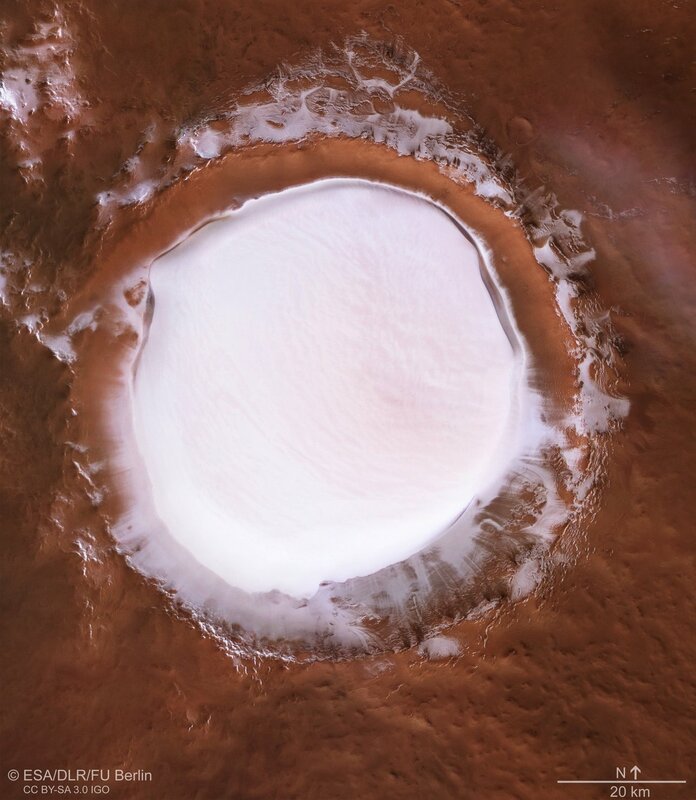 Korolev crater is 82 kilometres across and found in the northern lowlands of Mars, just south of a large patch of dune-filled terrain that encircles part of the planet's northern polar cap (known as Olympia Undae). It is an especially well-preserved example of a martian crater and is filled not by snow but ice, with its centre hosting a mound of water ice some 1.8 kilometres thick all year round. This ever-icy presence is due to an interesting phenomenon known as a 'cold trap', which occurs as the name suggests. The crater's floor is deep, lying some two kilometres vertically beneath its rim. The region of Mars has also been of interest to other missions, including ESA's ExoMars programme, which aims to establish if life ever existed on Mars. 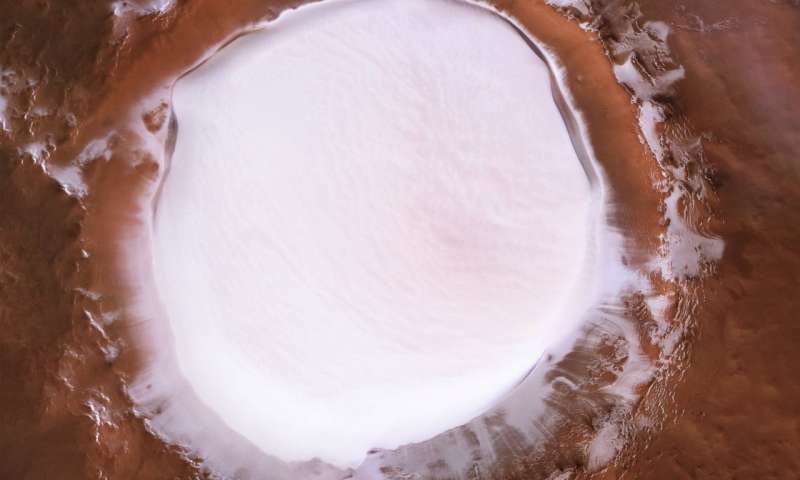 CaSSIS imaged a 40-kilometre-long chunk of the crater's northern rim, neatly showcasing its intriguing shape and structure, and its bright icy deposits.